Isn't it strange that comedy and horror are so closely related? When someone sneaks out to jump at us, our first reaction is to scream. So it makes sense that the very occupation that has been around to make us laugh for generations typically gives us the chills these days. This clown understands how to tow that line perfectly. She has all sorts of secrets in her bag of tricks! She doesn't just hop right into the horrible act she's best know for. At first, she warms her spectators up with a few funny jokes. She finds coins in people's ears. She does a silly dance when there's no music playing. She'll pretend to swallow a man's watch. But once she has her audience guffawing, she's apt to pull out her showstopping act that no one will ever forget. That is if they live to tell the tale. 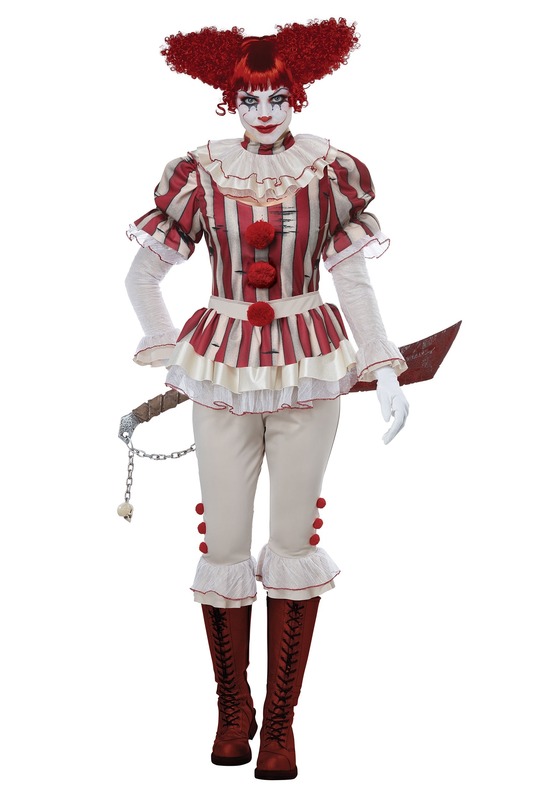 You'll feel ready to run away to that eerie circus troupe once you throw on this ensemble. This tunic is hip-length and has an aged stripe pattern. The cut of the top is dramatic with puffed sleeves, pompoms down the front, and a peplum that flares from the off-white belt. The red trimmed ruff will make your ensemble truly timeless. Finish off the look with the pompom and ruffled trimmed leggings and you'll feel your mischievous side rising in an instant. So, seems like you're ready to transform into this dangerous performer. Want to polish off your costume? Make sure your wig game is going strong. There's nothing like an unnatural hairdo to make your sinister presence complete. Now all you have to do is decide on your act. Here's a hint: Juggling has a lot of creepy potential. But we're just throwing that out there. Small Skirt Waist 26"-32" 26"-32"
Small Skirt Length 10" 10"
Medium Skirt Waist 28"-34" 28"-34"
Medium Skirt Length 10" 10"
Large Skirt Waist 30"-36" 30"-36"
Large Skirt Length 10" 10"
X-Large Skirt Waist 32"-38" 32"-38"
X-Large Skirt Length 10" 10"